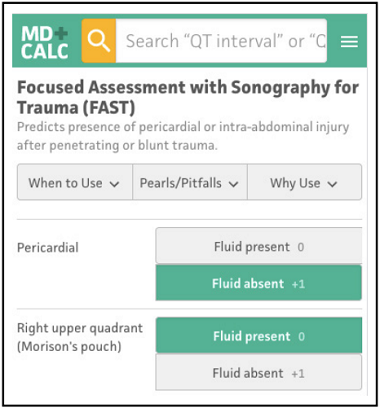 Focused Assessment with Sonography for Trauma (FAST) predicts the presence of pericardial or intra-abdominal injury after penetrating or blunt trauma. Focused Assessment with Sonography for Trauma (FAST) assesses for fluid in the pericardium or abdomen (hemopericardium or hemoperitoneum, respectively). The traditional 4 views consist of a subxiphoid view of the heart and pericardium, right and left upper quadrant windows, and the pelvis. More recently, the extended FAST (eFAST) has entered into clinical practice with the addition of bilateral thoracic views to assess for pneumothoraces and hemothoraces. Negative FAST does not exclude injury. Ultrasound is user dependent; therefore, clinicians should be cautious in the interpretation of negative FAST. Sensitivities of abdominal and suprapubic views in FAST vary widely, with ranges of 22% to 98% reported in the recent literature (Richards 2017, Carter 2015). In penetrating thoracic trauma, pericardial view sensitivity approaches 100% (Matsushima 2017, Ball 2009, Rozycki 1999), but cardiac injury can be missed if there is concomitant pericardial laceration allowing decompression into the left chest (Ball 2009). If clinical suspicion for injury persists despite negative FAST, FAST should be repeated, additional investigations should be performed, or intervention should be pursued, depending on the patient’s clinical condition. Most clinicians use the low-frequency phased array ultrasound probe (cardiac probe) to obtain all windows in FAST. Pericardial: Place the probe in the subxiphoid area and orient toward the patient's left shoulder. Apply downward pressure to look under the costal margin and toward the heart. The heart and pericardium will come into view, allowing inspection for hemopericardium and ultrasound findings of cardiac tamponade. Right upper quadrant: Place the probe in the right anterior to the midaxillary line (between the eleventh and twelfth ribs). Visualization of the hepatorenal recess (Morison's pouch) allows the assessment for hemoperitoneum in the right upper quadrant. Blood most likely accumulates here if hemoperitoneum is present. Left upper quadrant: Apply the transducer firmly onto the skin in the left posterior axillary line (between the ninth and tenth ribs) to visualize the splenorenal and subphrenic spaces. In practice, it is important to remember that the right and left upper quadrant views are often more posterior than anticipated. It can be helpful to bring the probe all the way down to the stretcher in order to best visualize these windows. Suprapubic: Place the transducer superior to the pubic symphysis and fan the probe inferiorly to visualize the bladder. FAST is a rapid, noninvasive, and repeatable imaging modality that can guide the surgeon in the decision to operate. It is performed in the trauma bay, and does not require patient transport out of the emergency department, which is risky for unstable patients. FAST should be used liberally in the evaluation of trauma patients. It is especially useful in patients with penetrating thoracic trauma and in unstable patients after blunt abdominal trauma. The clinician must consider additional clinical information including hemodynamic stability and clinical suspicion for injury. Positive: Emergent surgical intervention is recommended. Median sternotomy is preferred if the patient is stable; otherwise, use left anterolateral thoracotomy. Equivocal: Pericardial window or formal TTE is recommended. Negative: Close clinical monitoring or discharge are recommended, according to clinical suspicion for injury. Positive: In the unstable patient, emergent exploratory laparotomy is recommended. In the stable patient, cross-sectional imaging (CT scan) is recommended. Equivocal: In the unstable patient, DPA is recommended. In the stable patient, cross-sectional imaging (CT scan) is recommended. Negative: In the unstable patient, DPA is recommended if clinical suspicion for intra-abdominal bleeding exists. In the stable patient, CT scan, close clinical monitoring, or discharge are recommended, according to clinical suspicion for injury. Abbreviations: CT, computed tomography; DPA, diagnostic peritoneal aspiration; TTE, transthoracic echocardiography. Repeating FAST while preparing to perform diagnostic peritoneal aspiration is useful to quickly reassess unstable patients with blunt abdominal trauma who have an initially negative FAST. Intra-abdominal hemorrhage may not be significant enough on presentation to be FAST-positive initially. Be cautious if pericardial FAST is negative in patients with penetrating thoracic trauma, especially if unstable. Cardiac injuries can decompress through the injured pericardium, most commonly into the left hemithorax, resulting in negative pericardial FAST (Ball 2009). Therefore, unstable patients with this mechanism of injury and FAST finding should undergo a chest x-ray. If the x-ray reveals a hemothorax, a chest tube must be placed. Ongoing or high-volume chest tube output in this clinical context may be from cardiac injury. The original study conducted by Rozycki et al in 1993 utilized FAST in patients aged ≥ 16 years, after blunt or penetrating trauma (n = 476). When compared to gold standards of computed tomography scan, diagnostic peritoneal lavage, and/or operative findings, FAST had a sensitivity of 79% and a specificity of 96%. FAST was further validated in 1998 in a much larger study (n = 1540) by the same group. This showed that FAST is most sensitive and specific in patients with penetrating precordial wounds (sensitivity 100%, specificity 99%) and in hypotensive patients after blunt abdominal trauma (sensitivity 100%, specificity 100%). Rozycki et al (1998) concluded that the accuracy of FAST in these clinical scenarios justified surgical intervention on the basis of the FAST findings in these trauma patients. With the application of FAST outside of study protocols by nonexperts and nonradiologists, the contemporary diagnostic yield of FAST ranges more broadly. Recent studies quote a sensitivity of 22% to 98% for FAST in the detection of hemoperitoneum (Richards 2017, Carter 2015). More recently, thoracic views have been added to the FAST exam and termed eFAST. These windows assess the chest bilaterally for pneumothoraces and hemothoraces. In some series, the reported sensitivities of eFAST (86%-100%) are superior to that of chest x-ray (27%-83%) in the detection of pneumothoraces (Governatori 2015, Nandipati 2011, Wilkerson 2010). FAST results alone should not determine the decision to operate. Rozycki GS, Ochsner MG, Jaffin JH, et al. Prospective evaluation of surgeons' use of ultrasound in the evaluation of trauma patients. J Trauma. 1993;34(4):516-526. Rozycki GS, Ballard RB, Feliciano DV, et al. Surgeon-performed ultrasound for the assessment of truncal injuries: lessons learned from 1540 patients. Ann Surg. 1998;228(4):557-567. Rozycki GS, Ochsner MG, Schmidt JA, et al. A prospective study of surgeon-performed ultrasound as the primary adjuvant modality for injured patient assessment. J Trauma. 1995;39(3):492-498. Rozycki GS, Feliciano DV, Ochsner MG, et al. The role of ultrasound in patients with possible penetrating cardiac wounds: a prospective multicenter study. J Trauma. 1999;46(4):543-551. Richards JR, McGahan JP. Focused Assessment with Sonography in Trauma (FAST) in 2017: what radiologists can learn. Radiology. 2017;283(1):30-48. Ball CG, Williams BH, Wyrzykowski AD, et al. A caveat to the performance of pericardial ultrasound in patients with penetrating cardiac wounds. J Trauma. 2009;67(5):1123-1124. Nandipati KC, Allamaneni S, Kakarla R, et al. Extended Focused Assessment with Sonography for Trauma (EFAST) in the diagnosis of pneumothorax: experience at a community based level I trauma center. Injury. 2011;42(5):511-514. Governatori NJ, Saul T, Siadecki SD, et al. Ultrasound in the evaluation of penetrating thoraco-abdominal trauma: a review of the literature. Med Ultrason. 2015;17(4):528-534. Wilkerson RG, Stone MB. Sensitivity of bedside ultrasound and supine anteroposterior chest radiographs for the identification of pneumothorax after blunt trauma. Acad Emerg Med. 2010;17(1):11-17. Matsushima K, Khor D, Berona K, et al. Double jeopardy in penetrating trauma: get FAST, get it right. World J Surg. 2018;42(2):99-106. Carter JW, Falco MH, Chopko MS, et al. Do we really rely on FAST for decision-making in the management of blunt abdominal trauma? Injury. 2015;26(5):817-821. Describe different management modalities available for pelvic hemorrhages. Stratify management decisions of stable and unstable patients with known pelvic fracture. Date of Original Release: March 1, 2016. Date of most recent review: February 10, 2016. Termination date: March 1, 2019. AAFP Accreditation: This Medical Journal activity, Emergency Medicine Practice, has been reviewed and is acceptable for up to 48 Prescribed credits by the American Academy of Family Physicians per year. AAFP accreditation begins July 31, 2014. Term of approval is for one year from this date. Each issue is approved for 4 Prescribed credits. Credit may be claimed for one year from the date of each issue. Physicians should claim only the credit commensurate with the extent of their participation in the activity. AOA Accreditation: Emergency Medicine Practice is eligible for up to 48 American Osteopathic Association Category 2A or 2B credit hours per year. Goals: Upon completion of this activity, you should be able to: (1) demonstrate medical decision-making based on the strongest clinical evidence; (2) cost-effectively diagnose and treat the most critical presentations; and (3) describe the most common mediocolegal pitfalls for each topic covered. Faculty Disclosure: It is the policy of EB Medicine to ensure objectivity, balance, independence, transparency, and scientific rigor in all CME-sponsored educational activities. All faculty participating in the planning or implementation of a sponsored activity are expected to disclose to the audience any relevant financial relationships and to assist in resolving any conflict of interest that may arise from the relationship. In compliance with all ACCME Essentials, Standards, and Guidelines, all faculty for this CME activity were asked to complete a full disclosure statement. The information received is as follows: Dr. Shaukat, Dr. Desai, Dr. Copeli, Dr. Gursahani, Dr. Schechter, Dr. Jagoda, Dr. Shah, Dr. Damilini, Dr. Toscano, and their related parties report no significant financial interest or other relationship with the manufacturer(s) of any commercial product(s) discussed in this educational presentation. Hardware/Software Requirements: You will need a Macintosh or PC to access the online archived articles and CME testing. Additional Policies: For additional policies, including our statement of conflict of interest, source of funding, statement of informed consent, and statement of human and animal rights, visit https://www.ebmedicine.net/policies.